Motivation is what keeps us going. It is the reason people succeed and the reason people fail. Motivation is the drive someone has to complete a task. The ingredients of motivation are combined with many factors which include simplicity, attitude, the people you hang around, the way you think, knowing yourself, helping other people and so much more. 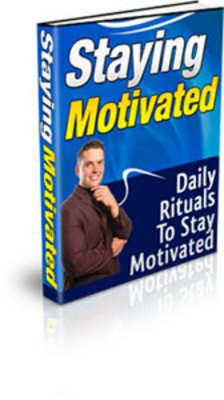 The purpose of this e-book is to take you through methods you can practice on a daily basis to remain motivated. These techniques can help you feel better about yourself in everything you do. You can take these methods with you when you go to work and when you are at home.